Welcome to Marycrest Assisted Living, a legacy of the Sisters of St. Francis. Marycrest is a specialized community serving adults. A life enhancement plan focuses on personal and spiritual goals for individuals with neurological disorders and cognitive & physical disabilities. We offer private living featuring wellness, therapy, clinical care, campus and community programming. Consistent with the values of the Sisters of St. Francis, we provide affordable unrivaled care that meets the needs of a unique population. Both Harmony and Serenity residences at Marycrest Assisted Living are affordable housing alternatives for those who need assisted living. The Serenity Residence is designed for adults, age 55 and older, while the Harmony Residence is reserved for younger adults. 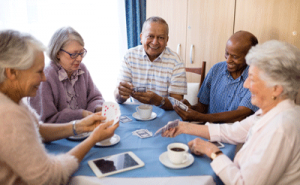 Together, residents and staff share in a variety of engaging programs, exploring lifelong interests and discovering new ones. Whether you enjoy cooking classes, reading, social gatherings, happy hours or pet visits, you will find something that is an individual as you are. Each community features private studio apartments with a large bathroom, kitchenette with microwave and refrigerator, individually controlled heating and air conditioning, and an emergency call system. We provide a complete range of supportive services, including three meals daily and a team approach to caregiving. For a personal introduction to Marycrest Assisted Living, e-mail Pam Wright, or call her at (303) 433-0282 ex. 225. Marycrest is far more than just a place to live – it is a place to experience life at its fullest. You will find countless opportunities here to grow in mind, body and spirit through musical performances, lectures, art, wellness programming, and community prayer and worship. Our welcoming, supportive and socially vibrant environment is vitally connected to the larger Denver community. Our approach to services allows you to stay in the assisted living setting longer, finding support for changing needs while maintaining your dignity and independence. Marycrest is deeply rooted in the values of service and compassion and that is the heart of who we are. The culture we create together is one of service to others and celebration of life’s gifts. The staff was so kind and helpful; they made me feel like I was home. Harmony Residence is the only assisted living community in Colorado dedicated to addressing the care needs and social issues unique to adults ages 20-65 whose disabilities prevent independent living. Serenity Residence is home to 90 older adults who require assistance or supervision with daily activities, which prevent them from living independently.